Growing up in southern California, artist, photographer and filmmaker Thomas Campbell was raised on the DIY aesthetic of the early 1980s skateboarding culture. Photography tips came from like-minded fellow photographers employed in the skateboarding press rather than from school, and art history was a matter of osmosis, not academia. In the mid-1990s, Campbell moved to New York and immersed himself in the scene around Alleged Gallery, where he quickly befriended and exhibited among the generation of artists who would star in the landmark 2004 exhibition Beautiful Losers. Campbell began documenting surfing culture in the late 1990s through both photography and film. His first feature-length film, The Seedling, came out in 1999, followed by Sprout in 2004 and The Present in 2009. Campbell's surfing photography has long been admired among by fellow surfers for its lack of gloss finish; unlike most, he eschews the familiar fish-eye shots or tightly cropped land angles. 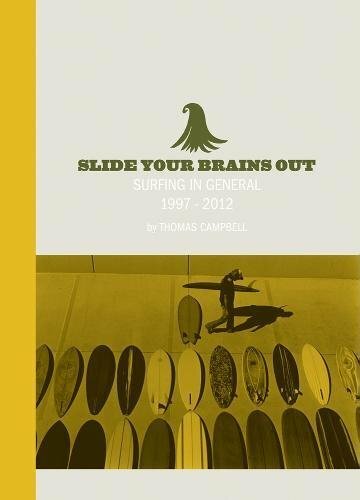 The first of ten projected volumes in Um Yeah Press' surf photobook series, Slide Your Brains Out compiles work from the past 15 years. Often lo-fi and gritty, other times lush and saturated, Campbell's compositions--which include portraits and action shots of some of the best surfers in the world--are always surprising and full of emotion, from melancholy to exultation. Thomas Campbell (born 1969) is a self-taught painter, sculpture, photographer and filmmaker. He divides his time between his painting/sculpture studio in Bonny Doon, California, and traversing the globe making films. Campbell has had solo exhibitions in New York, Paris, Tokyo, Denmark, the Netherlands, San Francisco, Los Angeles and Morocco; he is also creative director for the independent record label Galaxia, which has released records by Tommy Guerrero, Bonnie "Prince" Billy, Peggy Honeywell and the Black Heart Procession.